Here you are at the heart of the Hermitage, where its soul is revealed. The southern exposure of the hill, sheltered from the north wind contributes to its special character and the reputation of its wines. The soil diversity gives it its complexity and delicate balance. 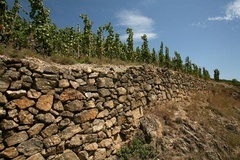 The granite rock face on which our cabin rests is one of the constituents of this exceptional terroir. The hillside on the left consists of pure broken down granite and sand. This type of soil brings structure and power to Hermitage wines. The vineyard cabin provides vital shelter for the vine grower and sometimes for their horse and tools. It is a characteristic feature of the Hermitage landscape.